The cab splashed through deep puddles and rain pelted the roof. They passed mounds of rubble, men in their clinging wet work clothes clearing flattened homes with picks and shovels and barrows. They passed St. Paul’s, rising stately and seemingly untouched from the ruins around it. Pride surged in Kat. The bustle of London—motors and buses and black umbrellas—continued as if there was no war. Londoners described the bombings as “blitzy,” as if they were some kind of nasty weather. 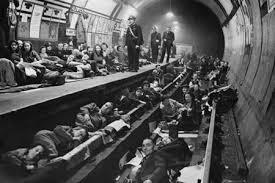 Londoners hunkered down in the Underground as the bombs fell. This fall marks the 75th anniversary of the Blitz. 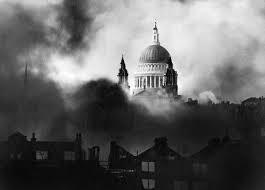 The Blitzkrieg (“lightning war”) was a relentless bombing campaign waged by the German Luftwaffe on Great Britain and especially on the city of London. The Blitz was Adolf Hitler’s attempt to break the British spirit. But the British refused to be cowed by the German campaign, and the Royal Air Force was able to defend the homeland. While many families sent their children to live in the country – and even to live in the United States – to escape the bombing, the British prided themselves on standing firm in the face of tragedy and deprivation. 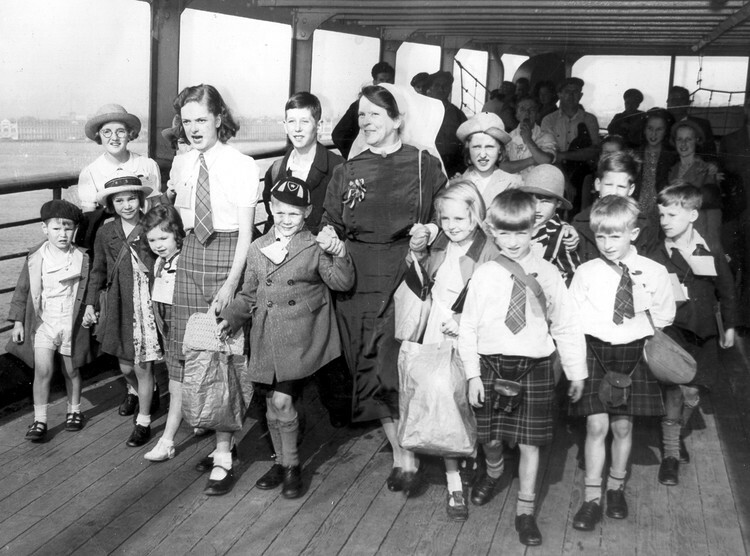 Children who left London as evacuees. The British did not falter even in the face of food shortages that required the government to introduce rationing. Meat, cheese, and eggs were among the foods rationed. Cottage gardens sprang up to combat the shortages, and ration books were the currency of the day. 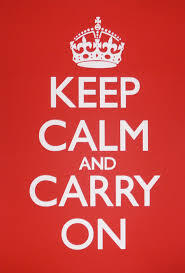 The British held on with a “stiff upper lip” despite the great odds and the shortages until the United States, which had held an isolationist position despite its alliance with Great Britain, entered the war after the bombing of Pearl Harbor in December 1941. The pieces that made up Katherine Bateson’s world were scattered across the landscape and over the ocean, far and wide, blown about by the winds of war. Kat herself felt like one of the clocks in Father’s workshop, all wheels and plates and springs and pins strewn across the table, waiting. But she squared her shoulders and told herself to hold her wits together. That’s what her father would want, and what her brother and sister needed. Especially given the urgency in Father’s letter to Mum, the letter sending the children away. England’s entry into World War 2 was forced by the non-stop aggression of Adolf Hitler’s Nazi Germany. 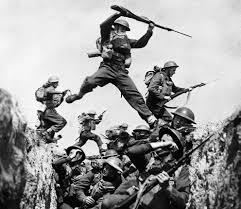 England formed the western front line against the German offensive; if not for English bravery and the entry of the United States into the European campaign, Germany might have taken Great Britain. The evacuation of Dunkirk was hasty and dreadful. In late 1938 Great Britain was led by Neville Chamberlain as Prime Minister. He was anxious to avoid another World War, and when Adolf Hitler’s Germany began an aggressive campaign in eastern Europe he cosigned the Munich Pact, giving Germany the go-ahead to invade Sudentenland in Czechoslovakia. Unfortunately, this Pact didn’t halt German aggression into the rest of Czechoslovakia, followed by the German invasion of Poland. The British had pledged support for Poland, and on September 3, 1939, Britain declared war on Germany. Winston Churchill replaced Chamberlain as Prime Minister in May 1940, and Churchill proved to be a charismatic as well as more aggressive leader. 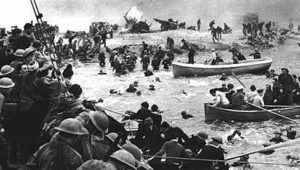 Later that same month the Germans staged a massive offensive, and the British Expeditionary Force had to evacuate Dunkirk in haste. Belgium and France fell to the Germans and the war gained terrible momentum. In the summer and fall of 1940 Nazi Germany, with its deadly Luftwaffe (air force), engaged the British in the Battle of Britain. German pilots assailed Britain with almost nightly bombings, especially over the city of London. These bombings were known as the Blitzkrieg (German for “lightning war), or Blitz. 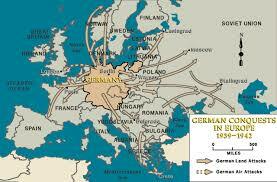 Nazi Germany was determined to rule all of Europe.